One of the most important aspects of candle making is choosing which type of wax to work with. It not only affects the quality and characteristics of the finished candle, the wax you use can also affect how you market your candles and/or influence those who buy them. The type of candle you want to make will help determine your wax type. Straight wax is 100% paraffin wax without any additives. The National Candle Association (NCA) defines paraffin wax as a by-product derived from the refining process of petroleum. It is the most common wax used in candle making and is valued for its opacity, lack of color and odor and its consistency in burning. There are a few reasons to pick paraffin as your wax of choice. Using straight paraffin wax allows you to experiment with additives to get special finishes on candles. Paraffin is the most economical wax you can buy and is easy to find, according to both Candlewic and Off The Grid News. Paraffin wax has really good scent throw and is often blended with soy wax to improve soy's scent throw. The material is sourced from non-renewable fossil fuel. Additives are needed to make high quality candles. Researchers at South Carolina State University placed paraffin candles in a small, enclosed 8 by 8 by 26 inch chamber and burned them for up to six hours. They found emissions of toluene and benzene, hazardous chemicals that are also present in many household items such as adhesives, printer ink, ink markers, furniture polish and nail polish. The NCA stands by the safety of USFDA approved food grade paraffin wax, (what candles are made from) stating that other validated scientific studies of all major candle waxes show the same basic burn behavior and that the waxes produce virtually identical combustion byproducts, both in terms of composition and amount. According to the Association, "No peer-reviewed scientific study has ever collected or analyzed emissions data on any candle wax, including petroleum-based paraffin, and proven them to be harmful to human health." The candles were not tested in manner consistent with the way candles are burned in the home. To minimize soot or smoke when a candle is burning, the NCA recommends to keep the wick trimmed to 1/4 inch. Always burn a candle in a well ventilated room away from drafts that can cause the flame to flicker, smoke and lose its teardrop shape. Container candles - Use wax with melt points between 121-131 degrees Fahrenheit. Votive candles - Use wax with melt points between 128-141 degrees Fahrenheit. Pillar candles - Use wax with melt points between 133-146 degrees Fahrenheit. Taper candles - Use wax with melt points between 141-146 degrees Fahrenheit. Vybar - Two formulations of this additive help blind fragrance oil to paraffin used in freestanding candles (103) and container candles (260) while a third allows for a higher scent load to mottled candles (343). Microcrystalline waxes - Micro 180 used at 5% in the making of votives and pillar candles helps increase opacity and produces a smooth, clean finish. Micro 845 helps prevent oil migration in container candles and helps eliminate surface imperfections. 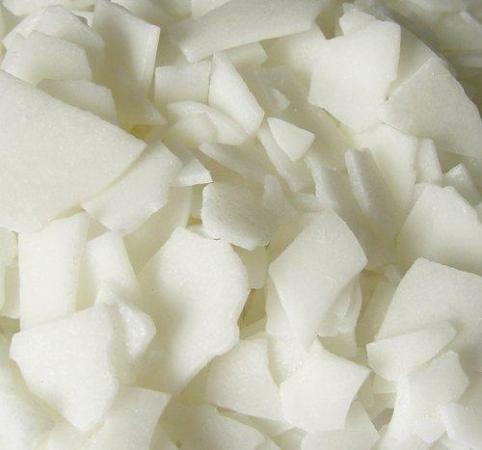 Triple Pressed Stearic Acid - A fatty acid derived from tallow (rendered beef or mutton fat) or vegetable oil used to modify wax to increase whiteness, to aid in mold release and to impart opacity. Also helps freestanding candles hold their shape in warmer seasons. UV absorbers - Prevents the discoloration of candle wax exposed to artificial and natural light. Petrolatum - A byproduct of petroleum that is soft and creamy; it's used in container candles to soften the wax, decreased shrinkage and increase adhesion to the container wall. Palm Stearic - Derived strictly from palm oil, it serves the same purpose as Triple Pressed Steric Acid while also increasing the fragrance load in soy and paraffin waxes and provides a smooth even finish on candles. Blended paraffin wax already has additives included. This type of wax is a good option for beginner candle makers and those who prefer waxes that are easier to use and that save time. The only things you have to add to blended paraffin wax are dyes and fragrance oil. 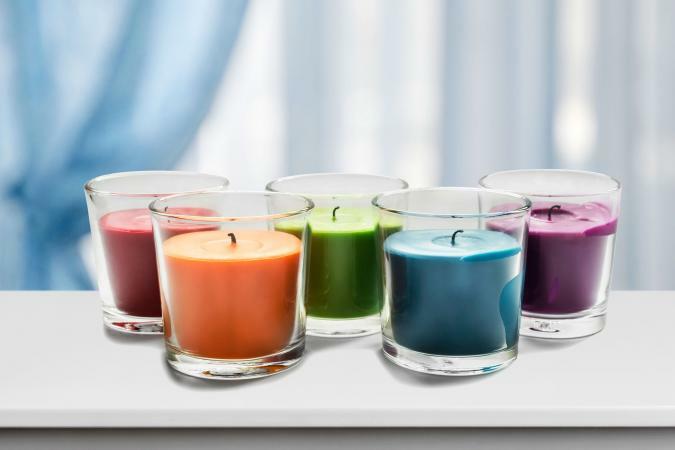 Blends are developed for specific candle types such as jars, votives, pillars and tapers. The disadvantage of using a blended wax is that it is much more difficult to achieve a different look for your candles. Candles and Supplies offers blended paraffin wax for a variety of container candles, votive candles and pillar candles. Soy wax is made from hydrogenated soybean oil. It is softer, slower burning and less transparent than paraffin wax. The NCA indicates soy wax was first used in candles commercially in the late 1990s, making it a relatively new wax when compared with paraffin, which was developed in the 1850s or beeswax, which has been used to make candles for centuries. Soy wax has plenty of pluses when it comes to selecting it for candle making. The slow burning wax can produce long-lasting candles. It is renewable, produced from fast-growing crops. It makes beautiful harvest candles in fall with its flat matte coloring. Soy wax does not release toxic chemicals when burned. In many instances, it is a one pour wax. Soy oil has to be chemically treated with hydrogen and nickel to harden it into a wax. Soy wax is mostly used for container candles; additives are needed for scented or free standing candles. Soy wax has an undesirable rancid smell and must be chemically treated to prevent it. Soy is an allergen and those allergic to soy are likely to steer clear of candles made from it. Some candle makers feel that soy takes in scent really well when blended with the right scent. You can also try a blended soy wax such as an all-natural palm/soy wax or a soy/paraffin blend. Melissa Hall, owner of Homemade Candle Creations and author of The Soy Candle Making Book shares a list of the various fragrance oils from different companies that she and other candle makers have had good experience with when making scented soy candles. Different formulations or blends of soy wax have been produced for making specific types of candles including votives, container candles and pillars. Nature's Gifts International, who manufactures the Ecosoya brand of soy wax is redeveloping the brand after ceasing production altogether, making pillar and votive soy wax largely unavailable, at least temporarily. CandleScience recommends Golden Brands 464 or EcoSoya CB 135 for container candles and tealights to get the best scent throw. EcoSoya PB was recommended across the board for freestanding candles -- look for a new version coming soon. Until then, try Golden Wax Melt & Tart soy wax for pillars, votives, and tarts. Note: If you need a smaller quantity than the 10 lb minimum offered at Candlescience, you can find Golden Brands 464 and Ecosoya PB in 2 lb and 5 lb bags at The Flaming Candle. For 1 lb or 8 lb bags of EcoSoya CB, visit Bulk Apothocary. Just as the name implies, beeswax is made from a secretion from honey bees when they are forming a hive. It is the most natural form of wax that exists and has been used in candle making for more than 1000 years, according to the NCA. You'll find plenty of benefits to using beeswax candles. Candles can be marketed as 100% all-natural. Candlewic calls it a prestigious, elegant wax. It has very little shrinkage and can be used to make container candles, pillars, votives, novelty and taper candles without needing additives. It has a high melt point, burns clean, slow and bright and has a sweet, honey aroma. Beeswax candles won't trigger allergens or affect asthma sufferers when burning. 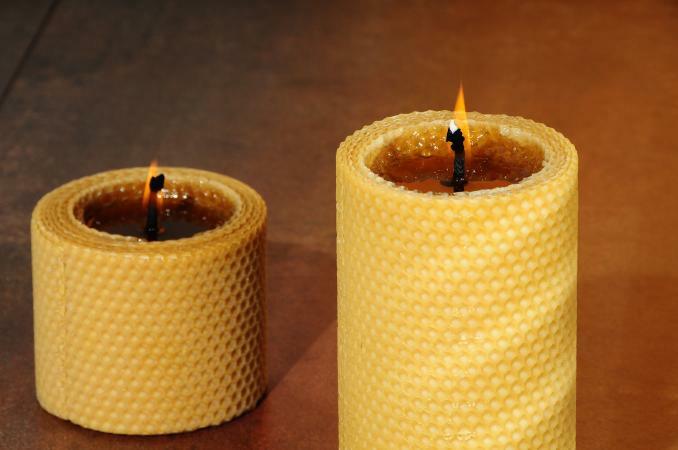 Beeswax is sold by the pound in blocks, by the ounce in pellets and you can also make candles from beeswax sheets that have a honeycomb pattern. Watch some YouTube video tutorials to see how it works when rolling large pillar beeswax candles using multiple sheets or making colorful twisted tapers. While beeswax has some great qualities, there are a few downsides. It is the most expensive wax, costing up to nine times as much as paraffin. Despite its high melting point, it can be sticky and soft, making it difficult to release for molds. Beeswax spills can be trickier to clean. The distinctive honey scent can mask or interfere with the scent of essential oils. With the dwindling numbers of honey bees, its use is controversial. There seems to be two sides of the fence when it comes to the environmental friendliness of using beeswax. Most vegans are adamantly opposed to using beeswax because of the unethical practices of many commercial beekeepers that harvest honey and beeswax in ways that are stressful and unhealthy to honey bee colonies. Many environmentalists and organic growers believe that supporting smaller, localized beekeepers, who only harvest when the bees produce in excess of what they (the bees) need, is essential to the survival of the honey bee as a species. The truth is, good beekeepers are passionate about both the bees and the environment and supporting them by buying ethically harvested beeswax is one way to help the honey bee population recover and thrive. It would be logical to assume searching for local "organic" beeswax would give you the result of something sustainably harvested but using that term can lead to more confusion. Products made from bees can't legally be labeled "organic" (per USFDA definition) because the bees can travel for miles and forage from plants or crops that may have been chemically treated. What you can seek out is a bee farm with Certified Naturally Grown (CNG)beeswax (or start the search with CNG honey). Sequim Bee Farm offers beeswax from ½ oz to 2 lb block quantities and is certified for natural beekeeping. Palm wax is made from palm kernel oil primarily sourced from oil palms grown in Southeast Asia, according to the NCA. The wax is hard, bright burning and very desirable for making candles. Like the other candle waxes, palm wax has some positive properties. It is very effective at holding and distributing fragrance (which is why palm stearic is often added to soy and paraffin wax). Capable of producing complex crystal formations, it produces beautiful finishes and color patterns on candles. It does not contain GMOs (genetically modified organisms). It's easy to work with and good for creating layered candles. Palm wax candles are very hard, burn slowly, and last a long time. Tapers won't bend, even in warm climates. Although palm wax is known for being tricky to work with, the extra time invested is well worth the advantage of having vibrantly colored candles with excellent scent throw and usual finishes. Unfortunately, many people feel that palm wax rivals paraffin when it comes to the environmental factor of how it is sourced. Unfortunately, there are some drawbacks to palm wax candle making. The palm oil industry has had a devastating impact on the deforestation of Southeast Asian rainforests. The wax must cool very slowly in order for crystal patterns to form on the finish. Shrinkage occurs if the wax cools too quickly once it is poured. The viscous nature of palm wax causes it to leave a thin layer of non-melted wax around the rim of containers - considered an undesirable trait in any other type of wax. You can find workarounds to the technical difficulties of working with palm wax, such as heating and then wrapping the containers to slow the cooling of the wax, as Peak Candle Supplies suggests. The environmental issues associated with palm oil and the products made from it are a much bigger problem and are worthy of thorough research by anyone going into the candle making business or even making candles as a hobby if palm wax is being used. Although the knee-jerk reaction to the problem of palm wax is to avoid it and palm oil altogether, this actually doesn't help and could potentially put even more rainforest in jeopardy, according to the Guardian. Replacing palm oil with other vegetable oil crops (such as sunflower, soybeans or rapeseed) would require even more land, since palm trees produce more than 4 to 10 times the amount of oil as other crops per unit of cultivated land. A better solution is to source certified sustainable palm oil (CSPO). Start by looking for wholesale distributors of palm wax that indicate they source their materials from manufactures that are RSPO members or look for the RSPO logo. For more information on how to research the palm oil supply chain, visit SPOTT. The Lone Star Candle Company offers Glass Glow Palm Wax for containers, Starburst Pattern for pillars and votives and Feather Blend Palm Wax for pillars, starting with 10 pound bag minimums. Lone Star claims their palm wax materials come from a RSPO member source. Before you buy, ask them to name their source and explain you're only interested in purchasing certified sustainable palm oil products. Medium grade gel is the most common used by candle makers, as it holds more fragrance than low-grade gel and is less expensive than high-grade gel. Making gel candles allows crafters a lot room for creativity. Gels are favored for the crystal-clear transparency of the material. Embedded objects, like seascape items, are a popular embellishment. Very little dye is needed to color the gel. Gel wax is slower burning than paraffin but melts at a higher temperature. Wax additives other than color and fragrance are not needed in gel candles. 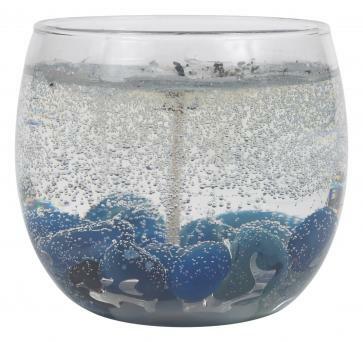 Lots of things can be embedded in a gel candle such as seashells, marbles, colored floral glass pebbles, rocks, sand, wax fruit or wax flowers - small nonflammable objects. Anything that can catch fire, such as cinnamon sticks, dried potpourri, small pinecones, dried fruit, and small plastic figurines, are not safe. It's easy to over color gel candles and only liquid dyes should be used. Using the wrong type of fragrance can cause gel candles to catch fire. Making your own gel is risky and you could be liable for damages if it catches fire. Candlewic and Rustic Escentuals stress the importance of only using non-polar scents with a flashpoint of 170 degrees (or higher) in gel candles. Polar scents can lower the flash point of the gel material or separate from it, creating a fire risk. Look for fragrance oils that are specially formulated for gel candles but then test them to double check their safety. Stir the mixture for one minute. If it looks cloudy, the fragrance oil is not compatible. If the mixture is clear, let it sit for half an hour. If there is no separation of oil, proceed with the second test. Reverse the ratio to 3 teaspoons of fragrance oil to 1 teaspoon of mineral oil. If the mixture stays clear after 1 minute of stirring and sitting for 30 minutes, it is compatible to use with Penreco candle gel. Due to the higher burning temperature of gel candles, Candlewic recommends zinc wicks work best. When choosing a sustainer base for the pre-wick assembly, look for a base with a long neck (ideally at least 6 mm long). This will help ensure that the flame is extinguished before it reaches the bottom of the container. The Candle Maker's Store offers Penreco candle gels in high, medium and low density formulas. Buy in quantities as low as 2 pounds or up to 10, 25 and 50 pound boxes. Perfecting handmade candles takes an abundance of materials, testing, patience and time. No single wax type outshines the rest without drawbacks. Ultimately, you'll need to pick a wax type and supplier that you can stand behind because you believe in the quality, safety and use of the ingredients.